Under Mayor Michael Bloomberg, New York City’s education system embarked on a massive change effort, known as Children First, that produced significant results: new and better school options for families, more college-ready graduates, and renewed public confidence in New York City’s schools. New York City’s reform effort has also produced significant change beyond the city’s own schools and has helped to set a national agenda for reforming education. Over the past 12 years, other districts, especially in large urban centers, have looked to New York City for ideas as they work to improve outcomes for their students. New York City’s central administrators have also gone on to lead districts elsewhere in the nation, spreading not just particular reform strategies but also a mindset focused on bold and rapid system change to improve student achievement. This report tells the story of how Children First reforms evolved over the course of Bloomberg’s mayoralty and synthesizes research on the effectiveness of those reforms. Urban district leaders can learn from both the successes and challenges of New York City’s ambitious reform effort. A governance shift from a fragmented, locally based system of 32 community districts to mayoral control. It was the foundation for change that made other reforms possible. Devolving authority to building principals who were closer to the classroom and who could make better decisions about budgets, staffing, professional development, and operations to support their schools. Well ahead of the curve, New York City also created a district-specific training academy for principals to ensure they had the necessary skills to support high levels of autonomy. Creating small schools to replace large, impersonal high schools and transform them into smaller, more personalized environments. The shift to small schools eliminated “dropout factories” and better supported students, especially high-need students, to graduate and go on to college. Research shows New York’s small schools of choice have reduced dropout and increased graduation rates while encouraging more students to meet higher standards. Welcoming charter schools to the system while holding them just as accountable for student performance as district schools. Charter schools have been encouraged to use available space within existing public schools. National research shows New York City’s charters outpace the nation in measures of student performance. Increasing funding equity within the district by using a weighted per-pupil formula to allocate the majority of school-level funds. This was a significant departure from the traditional system of building school budgets based on teacher salaries, which gives more resources to schools with highly educated, veteran teachers regardless of the student populations they serve. The new formula shifted resources toward high-poverty schools and schools with large numbers of disadvantaged students, such as students in special education and English language learners. Revamping teacher recruitment, pay, and hiring strategies, allowing New York City to recruit and retain a stronger teaching force and compete more successfully with nearby suburban districts. Human resource reforms shifted the hiring timeline earlier, in line with suburban practice. Highly selective alternative certification programs trained teachers who replaced unlicensed staff. Broad pay raises combined with a focus on improved salaries for early-career teachers also made New York City more competitive with surrounding suburbs. Proactively addressing Common Core State Standards implementation. In 2010, all New York City public school teachers were introduced to Common Core standards. In summer 2013, teachers received new curriculum materials aligned to the standards and vetted by the central office. A short-lived attempt to enact a pay-for-performance system for teachers failed. Over three years, New York City piloted a voluntary program that awarded bonuses of up to $3,000 per teacher to schools that met performance targets for school environment and student performance, including student growth on standardized tests. Ultimately, research showed the program had no impact on teachers’ reported attitudes and behaviors and no impact on student achievement. New systemic efforts to support schools have struggled to gain traction in the face of difficult school-level conditions: weak internal capacity, competing priorities, and the rapid pace of change. Since 2006, New York City’s schools have begun to assimilate new supports, from Quality Reviews in which outsiders carefully observe the school, to creating in-house teams of teachers and administrators focused on refining instructional practice based on data and results for students, to building relationships with peer schools and support providers through networks. To varying degrees, teachers and administrators have struggled to find time and energy to incorporate these supports into their work. As is true elsewhere, New York City’s education leadership is struggling to calibrate the right balance between pressuring schools to change in response to high-stakes accountability and supporting them to change by promoting networks, coaching, and collaboration to build a trust-based, professional culture. Finding the right balance will entail both attention to a balanced set of accountability tools—including test scores, surveys, student college and career outcomes, and more—and focus on providing time, professional development, and feedback for teachers to make the leap to new heights of instructional practice. A recent report from the Parthenon Group recommended system leaders give sustained attention to streamlining policy and upgrading archaic systems and practices with the goal of freeing principals’ time. More time would allow them greater opportunity to lead instructional change in their schools. Focus on the school as the site of change and the principal as the primary change agent. Perhaps the most significant reform under Mayor Bloomberg was the decision to offer schools autonomy regardless of past performance in exchange for accountability for future results. This groundbreaking exchange opened up new possibilities for innovation even in schools with poor track records of educating their students. New York City also took important steps to support schools and their leaders. By eliminating layers of middle management, the city shifted significant resources away from the central office and toward schools. It also used per-pupil budgeting to realign more resources to schools with higher enrollments of needy students. At the same time, central office gave principals much greater authority to determine how to allocate those resources to support teaching and learning. By working with the union to change seniority privileges, New York City also gave principals much greater control over teacher hiring—a key lever for building a professional climate in their schools. Develop a pool of talent—teachers and principals—who are well versed in the local context and needs. New York City partnered with outside groups to improve its recruitment, hiring, and retention strategies and created district-specific training programs for principals and teachers. Sustain the highly successful small high schools and investigate the reasons for their success. 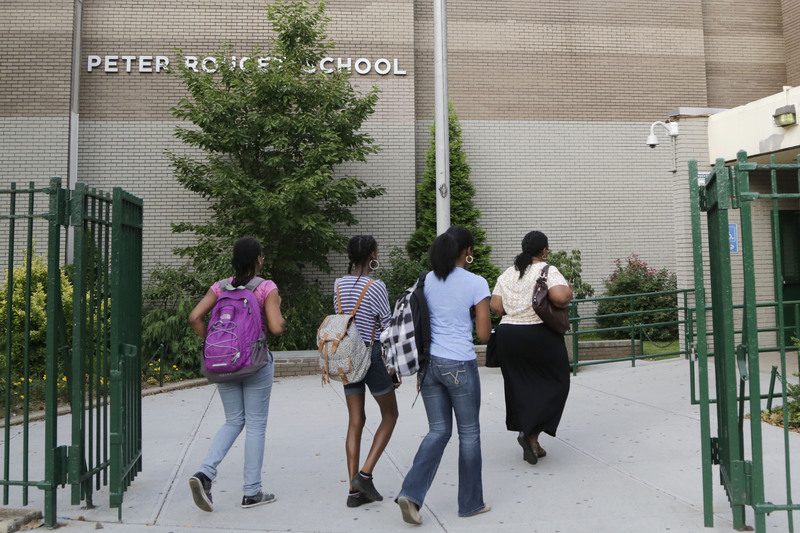 Since 2002, New York City has opened more than 200 small, nonselective high schools, largely concentrated in the Bronx and Brooklyn. They were designed to serve students in the city’s most disadvantaged neighborhoods and many replaced large high schools with histories of low performance. A growing body of research shows these small schools have improved student attendance, graduation rates and college performance. Build a portfolio of schools to encourage school-level innovation and give families quality options. While the national picture of charter school performance is mixed, New York City’s charter schools—particularly those run by a handful of charter-management organizations—have shown strong results for student learning. Facilities support coupled with strong accountability for performance appear to be among the keys to New York City’s success. Balance “disruptive change” with clear priorities for the work of principals and teachers. In New York City, Mayor Bloomberg and his education team emphasized the need for bold, rapid change in both the system and the schools. But deep change in teachers’ classroom practices requires disciplined focus, consistent priorities, and patience with adult learning. Researchers repeatedly noted that in the Bloomberg era, New York City educators scrambled to assimilate frequent policy changes, build communities of practice, and access needed district-level supports in a rapidly shifting system. Urban districts must balance the pressure for quick results with the often slow and difficult work of transforming struggling schools into strong, collaborative learning communities. A district must send clear, focused messages to principals and teachers about the district’s priorities in improving practice and provide time and external expertise as needed to help staff master new skills that are essential to produce lasting results for students. Maureen Kelleher, a former associate editor at Catalyst Chicago, has spent more than 20 years in urban schools as a policy researcher, reporter, and high school teacher.